Click this ad to visit my website! Teal Marie Davidson, 25, of Livingston. Cat and Mouse Game... Mouse Caught (with Meth), LIVINGSTON, October 24, 2016 - On October 23, 2016 Officers with Livingston Police Department were dispatched to the 1200 block of North Washington Avenue in reference to a theft that had previously occurred. When Officers arrived they were advised the suspects had left in a beige colored SUV. Officers were able to locate the vehicle and conducted a traffic stop at the 200 block of East Church Street (Melbo's). During their investigation Officers identified the driver of the vehicle as Teal Marie Davidson, 25, of Livingston. Officers gained consent to search the vehicle where they recovered scales that appeared to have a white residue on them. While Officers were conducting their investigation Teal Marie Davidson dropped a small black bag and used her foot to push it under the vehicle in an attempt to hide it from Officers. Officers located the small black bag and opened it. Inside the bag Officers observed four small baggies that contained a crystal like substance which field tested positive for the presence of Methamphetamine. Officers also recovered several syringes and two small brown bottles of a liquid that also tested positive for Methamphetamine. 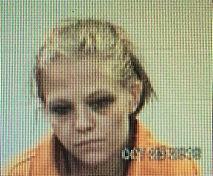 Teal Marie Davidson remains in Polk County Jail pending bond. Davidson allegedly dropped a bag (filled with methamphetamine) on the ground, then scooted the bag under her vehicle with her foot (in order to hide the meth). Officer Adam Williford pictured conducting a vehicle search while Davidson's passengers wait outside the vehicle.